Most of us ask for testimonials. And if we follow up and pester our customers enough, we receive testimonials. There’s only one problem. These testimonials have no power. Testimonials are stories. And stories potentially have power and grace, flow and rhythm. Look around you and you’ll see none of that in most testimonials. 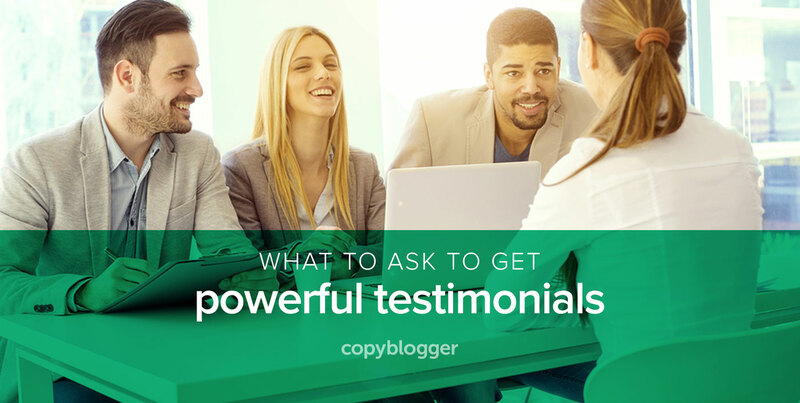 We’re going to fix that today by examining six key questions you can use when asking for testimonials. 1. What was the obstacle that would have prevented you from buying this product? 3. What specific feature did you like most about this product? 5. Would you recommend this product? If so, why? In the comments below, share your tips for collecting persuasive testimonials. Editor’s note: This is the second part of The Secret Life of Testimonials. The original version of this post was published on April 8, 2010. This is an amazing post! Thanks for sharing this information. As a business owner, I can apply this ASAP! I bought “The Secret Life of Testimonials” a few weeks ago. It’s a great ebook — I already used it to solicit several LinkedIn recommendations, and I used Sean’s framework to write testimonials for others. Totally worth the $45.95. Thanks Karl. Testimonials may seem pretty simple, but it’s an extremely deep and interesting topic. These work fine in reference to products, but what about questions that relate to services? One of my clients is a business consultant, so he doesn’t sell products. Any suggestions? I’ve just come across this great post, and have immediately created a survey form through SurveyMonkey to ask recent clients for their testimonials. One of my first queries was the same as yours – I offer services, not products. But that’s ok – it’s just a matter of re-wording the questions a bit, eg what specific feature did you like most about our service? My next question is how do we ‘compile’ those answers into a usable, effective testimonial? Ah, that’s a really good question. I like systems, so let me think this one through and get back with an answer. Just for the record, I mostly run it as it is, but I’m sure I do some things in a sub-conscious way. Which is why I need to step back and come back to you later. Not an exact one but you both Down and Jacob can consider below set of questions, which I always asked my clients for a perfect testimonial. 1) What was the problem that you have faced while having our service? 2) Are you satisfied with the result of hiring our service? 3) What specific key aspects or support you like the most in the duration of having our service? 4) Which phase you loved the most of our service? 5) Highlight “N” numbers benefit our service. 6) Would you recommend our services? If so, why? 7) Share the bad experience you had (If any) while having our service. I hope this will help you to get the best testimonial from your clients. Our clients have a mix of products and services. And there’s training too. When you ask the questions, you’re taking the client on a journey. So the before/after is the part that cannot be ignored. We have services too: the Article Writing Course or the headlines course is a service/training. And we ask similar questions. Just substitute “services” (specific name of service) for products and you’ll get some amazing insights into how clients see your business. That’s the key: to see your business from the client’s eyes. The fact that they praise you as well, well, that’s a big bonus. This is the best thought out strategy for obtaining testimonials that I have ever read. That it manages to also act as research to find out more about customers’ thinking is a real bonus. The research is the part that excites me the most. To see how the clients perceive your product or service. We often get testimonials that are 1500 words long. Sometimes longer. 6 questions is too many. Keep it to 3.
if you and the client are writing testimonials that jointly promote each other. You see this all the time on the web when Blogger 1 ‘recommends’ Blogger 2 who in turn bigs up Blogger 1 and so on. In fact if I know the client well, we increase the no. of testimonials to 17. Why? Because we’re not after testimonials? We’re after an experience that the client has been through. That experience is read by other clients. If you’re only after sales, then everything can be very tidy and short. But if you’re after great clients then the depth of the questions elicits a 1500 word experience. Others read that experience and decide to join. If you get to any of our live courses, online courses etc. the one repeated statement is: How do you manage to get such great people in a single room/course? The answer is a combination of testimonials and barriers. But it’s the testimonials that drive the painful clients away and attract the ones we want. Here’s an example of a course that’s already complete (and how we use the testimonials in a prospectus). As you’d expect, there’s also a barrier. We like to filter our clients. Finally! This is the best outline for helping customers write a testimonial that I have ever seen. Great work Sean. You product looks good as well. What you’re looking for is the “uniqueness”. That’s what “no other product/service delivers”. While this 6 part testimonial is a starting point, I will go on to ask as many as 17 questions. It depends on the depth of the relationship. Here are the 17 questions—and why I ask them. These questions are for a course, but could apply to a service just as easily; or to a product. You have to tweak it a bit to make it work for you. 17) Anything else you’d like to add? @Dawn, the process is totally identical for services. In fact, Sean originally wrote this as “product/service,” but it kept messing up my formatting. Just swap the word out. Thank you for providing valuable information to use in getting testimonials. I am a consultant and my main focus is helping small businesses get more customers through social media marketing. I can see how this format has tremendous potential for selling both products and professional services. You’re welcome 🙂 I hope you get some great testimonials and feel free to ask any more questions. Great series! What I have done is really try to focus on Linkedin for example. It doesn’t guarantee the great story (weakness) but still proof that there is an actual person behind the testimonial vs (Ray S from Florida) crap which by the way many are still doing. Oh another related note HOT girls on the pic yeahh baby love the girls LOL 🙂 I used to work in New Orleans (radio) having flash backs! Great information. Now, I need to shift this information to adapt to the fiction-selling business. Thanks. Excellent stuff – I’m not surprised. Since my clients hire me to write I often quiz them in a similar fashion and then write a draft for them. They seem to appreciate it and often make it way better than I have. One thing I really like about Sean’s process is that it’s so step-by-step that you can very readily hand it off to an assistant or partner. (He talks more about that in the paid version.) It feels kind of weird and awkward to ask your clients how they feel about you, but it’s much easier if a third party is doing it. Plus, if my assistant handles it, it, um, gets done. @Dawn: Several thousands of our clients sell services alone. And so do we at Psychotactics. The process works, because of the way a human being thinks. There’s a before/after/salient point/salient points/oh one more thing. The testimonials you get are so long, rich and detailed that you no longer have a testimonial, you have an experience. There are emotions, objections, overcoming of objections and frustration with previous vendors/services. Try asking the six questions. We’ve been using this system since 2004, and if you go to Psychotactics, you’ll find not only do we use it but our clients use it to get amazing results. Um, of course everyone doesn’t believe you get amazing results and the proof of the pudding is in the eating. And it works because we all go through that sequence. e.g. I wanted to buy into your “(insert services here) but…. And that starts off the testimonial. I’ve cut and pasted a small part of a testimonial here because on our site it’s a mile-long 🙂 You’ll see how it unfolds. (Note: I don’t do consulting any more, so it’s safe to say this is not a promo for my consulting below. But it’s still on our site). Live Example: Excerpt out of a very lonnnnnng testimonial. “I didn’t set out to work with Psychotactics. In fact, for months I had been searching for services that would help our business. I found similar consultants, some of them even specialised in tourism. Yet none of them provided me with an iota of information. All I got was, ‘This is how much it is going to cost.’ And all of their sites were like online brochures. I was really looking for something that could help me. Now, it’s not like their services didn’t interest me. They had good testimonials and seemed to be reliable. But there was nothing in there that made me read the site or say, I can implement this right away or this is a good idea, whereas, with your site I was there for hours. In fact, once I read the first page, I was hooked…. Yes you hit on the “other side of the coin”. This experience is truly amazing. The testimonial may make you feel all fuzzy and happy, but it sends a chill down your spine when you realise how close you came to losing a customer, and what finally made the customer decide to go with you. Just yesterday a client wrote me a testimonial (yes, of course I asked the six questions—why wouldn’t I?) Is the testimonial usable as is? In this case it wasn’t and would need a bit of back and forth with the client. But the client specifically mentioned how they’d come very close to just ignoring us, and why (it had nothing to do with us) and this gave me a very important insight into how to send out our message via email in future. So yeah, getting warm and fuzzy is only half the deal. It’s well worth the process of understanding what’s going through the client’s brain. That’s a goldmine waiting to be tapped. And no matter how many testimonials you get, and how many insights, there’s always one more that makes you think…now why didn’t I think of that? The interesting part about this sequence is that if the client didn’t buy that service, they would not have bought the next one. And believe me, it’s hard enough to get a client, but you really want to keep one. Thanks to the insight and the response, this client will not only stay with us, but his testimonial will help bring more clients just like him. Which is the ultimate goal of a testimonial: To get super-clients who love your work, respect you and are willing to pay the price you ask. I would not recommend it. You’d only get a partial picture. See what I wrote in response to @leadershipcoach. It’s not just the warm fuzzies you’re looking for. You’re also looking to get clients who can lock into the very same emotion—but more importantly the 6 questions enable you to see how the client is thinking. Because the client is so ready to be part of the process, you should take advantage of asking the six questions. Over the phone this process takes no longer than about 8-10 minutes. And you get a testimonial of 1500 words or more. That’s rich data for you even if you never use the testimonial in your sales copy. Feel free to use just three out of six. I wouldn’t recommend it, because the process of asking six questions does a heck of a lot more than just get you a great testimonial. It was right on time for me because I am just now preparing to start pestering some of my customers from this last year for testimonials. I thought it was only fair to give them 6-12 months to try the product and then ask for the amazing health results that I know that most have gotten. For many, because I have been in constant contact with them through out this past year, I think I will phrase my questions differently. But for those with whom I have not had as much contact, I will pretty much use the suggestions in this article. Excellent tips, Sean! I especially like your suggestions about using testimonials to directly address the prospects’ objections. So many of us just slap testimonials on a page thinking that simply having them there will help make the sale. I love this article and the questions are great. But here’s what I’m always confused about: If I ask 6 questions, I might get 6 sentences or small paragraphs that don’t really flow together— what’s the best practice for turning that into a great soundbite or cohesive quote that you can put next to someone’s picture on your website? I always hesitate to ask a lot of questions because I want the quote to “flow”, but then I know the testimonial wont be as powerful as it could be. Any advice? Now that I know exactly the steps to take when asking for testimonials, I’ll be using them more often in my business! Hi Sean — brilliant methodology and outline , as usual. I recently spent some time examining the testimonials on your site, and doing some deep self-examination to come up with a remarkably similar list of questions for my own clients, after getting a one-line testimonial from an otherwise very happy client… 🙂 I’m so happy to see your actual 6 questions, though, because the specificity and focus of the Q’s is key. I’m just concerned that sending clients too many questions in a testimonial request can be off-putting – although I haven’t yet done a phone call for testimonials… perhaps that’s the true magic bullet. Saw psychotactics web site. Love your dissection of buyer’s subconscious. Standouts: “See the Forest for the Threes” wordplay (ref. Power of 3 to Improve communications” article). Awesome. Also liked “Power of “Why” piece. Even more powerful question than “why,” in my opinion: “Who cares?” The best reads tend to be about stuff everyone thinks about, just can’t articulate, really. You did it! p.s. just wanted to say that using the information i’ve gleaned from you in the past has definitely resulted in one of the best testimonials i’ve ever received (just reviewed it now, it actually scared me with its awesomeness, and i had delayed adding it until just now). One of the key techniques is to make sure that you set the expectations of the customers in advance. A lot of customers may think they need to be short or terse with their comments. You need to say: You can keep your answer as long as possible. That statement alone gets the customer relaxed and gives them the “idea” that you’d love a longer answer. And most (not all) will willingly oblige. Email may prove to get shorter answers, though I’ve personally got long answers via email (as well as very short, almost unusable answers). The method that works the best is via phone/Skype and you recording the call. Of course the customer needs to know you’re recording the call, and after a brief discomfort (because you’re recording) they’ll settle right into answering your questions in immense detail. Believe me—your problem will be the reverse of a short testimonial. You’ll have such a long testimonial and so much detail that you’ll be gobsmacked (that’s a Kiwi word for yippeeyahooeywowIcan’tbelieveit). Pretty late in the day to be asking questions in this thread but as they say, if you don’t as you won’t ever get. So here I go. On testimonials I have heard that it is better to let the client speak out in his/her own voice instead of you polishing it and making it look like copy. But if the testimonial is too long and I don’t want to be gobsmacked (no one does) I suppose I will have to take the editor’s scissors and do some chopping. That question may help (depending on the situation—your specific situation). I would ask that as a separate question, almost like a P.S. so that the call is done, and then you’re almost having a conversation. I don’t think it would quite fit in the six questions for a testimonial. Thanks for this Sean. I’ve put it in my ‘important bookmarks’ file for when I get my own products up and running. Genuine testimonials presented properly are powerful decision-making nudgers, that’s for sure. They certainly work on me. Very useful post. I am scheduled to shoot a video of a client’s testimonial tomorrow. Asking the six questions will make it easier for the client to tape a concise testimonial. What a great post! i have printed it out and am keeping it on my desk for reference. Thank you! Nice article.. I will find the problem when I want to produce future products, but after reading this article at least I can know how to handle it, Thank you. I like this post, Sean. I like how you drill down on why these questions are so important and why asking them in this order is vital. As a B2B marketer who has gathered many testimonials over the years, I’ve always found that a good question to ask is ‘if you were talking to another ________ (IT professional, landscape contractor, attorney, etc.) what would you tell them about Product X?’ This may be viewed as a variation of question 5, but I’ve found it to produce some very compelling content. Testimonials are a good way to really get an idea of what products people liked and exactly what about those specific products people liked. Heck, you can do a lot with testimonials besides products also. Most of my clients are time poor, especially at a C level, and won’t respond to 6 questions. No way. They’re under huge time constraints and don’t have time for this. I guess this begs the question about your target audience. Who are you targeting? The higher you go, the harder it is to get past the EA etc. I hear what you say about getting a more rounded picture that you can then expand upon, but that’s on the condition that they play ball in the first place. If you have a complex product or service, you might consider asking about delivery/implementation. This is often a key objection that lurks in the sales process. Statements like these diffuse worries about the delivery/implementation aspect of complex products and services. And give a great opportunity to showcase customer service skills and a customer-centric approach. I’m a big fan of your work, Sean. In fact, I refer often to your “Why Headlines Fail” ebook when creating blog post titles, etc. This series about testimonials is powerful. I particularly enjoyed the point that if we try to control the testimonial, we might end up with a false positive. Instead, we should encourage a candid response — one that will be truly helpful to us and our future customers. You’re right. The answer would be compellingly different. Incredible and ironical as it may sound…testimonials are the key to getting the clients you want. If you look at the headline on the sales page and the entire tone of the book I’ve written, it’s about “How testimonials help you get better clients”. Without the testimonials, it’s hard to attract clients that you deserve. Or rather testimonials from “difficult” clients get you difficult clients in future. And testimonials from “clients that you love” are going to get you “clients that you love”. Our clients are wonderful, because they’re drawn to a message. That message is located in the testimonial. Just as a testimonial draws clients, it also repels clients. Which is good for us (and will be good for you too) because you don’t have to muck around with clients who you don’t want in the first place. The candid response has a great depth of emotion, jargon, phraseology etc. that may not appear outstanding to you, but will definitely appeal to your future customer. The mistake we all make is we think “we are our customer”. This is just what I needed. Last month I asked for testimonials and what I got back was… well crap. Nothing I can really use. I was just thinking last week that I needed to make the request more specific, but wasn’t sure exactly how. This is perfect. I wrote a testimonial for someone’s health & wellness product recently. It was the first one I’ve ever written and, if these questions had been provided to me beforehand, it would have certainly made the task much easier from my perspective. Even though I worked hard on producing a quality testimonial for that ebook author and believe he was happy with the results, I just emailed him a link to this article and asked if he’d like me to rewrite it using this system. Even if he says no, I plan to do it anyway and he can choose the one he likes best. Sean the most important one is #5. Because recommendations goes a long way. I agree with the idea of starting things off with an objection. Asking “what could have stopped you” is a good way of convincing potential customers of the soundness of the purchase, by showing how others had their fears allayed. However, I suspect that my bosses might think otherwise. In some industries, where negative PR flies high and wild, the mere idea of introducing a negative emotion is strongly opposed. Any ideas of how to pitch this to the higher ups? @Pete, that’ s a tricky one. I’ve encountered that as well. A lot of good persuasion is negative, but a lot of corporate folk are violently opposed to any negativity in corp comm. Which is one reason so much of it is so deathly dull. I was a complete failure at selling anything up the ladder (one big reason I left the corp environment), but you might try reading _Switch_ by Dan & Chip Heath. They talk quite a lot about how to effect change when you don’t have the power to dictate change, and they include some great “convincing the bosses” case studies. One thing I did see work from time to time — send articles like this one to the people who *do* have the power to dictate that change, and let them think that it was their idea. However your terminology also matters. If you call it “Negative” it won’t work with anyone let alone your bosses. If you say we’re finding the “BEFORE /AFTER story” they are quite interested, because they’re the “AFTER” part of things. Hard to say which is most important. Kinda like saying the “heart” is the most important part of your body. They all count to create a great testimonial. This is perfect! I’ve been doing what everyone else is by just asking for and accepting whatever I get. Providing questions not only makes it a better testimonial for me but it probably makes it easier for the customer. Having testimonials that answer objections is genius! Yes, this is very interesting to those who need more information about what they want. Seven questions that we should prepare for them. It is a great idea to use this method and gives structure to their response. I like the idea behind giving them a structure to the testimonial, but wouldn’t this take away that personal touch that would come through from them free writing a testimonial? “Would you recommend this product? If so, why?” I think that is the most important question. Thank you for this article. It was informative. I loved the idea behind this article and the information is incredibly useful. Thank you. This is very helpful. I will read the first article too. I am printing this now. I should have done this long ago. This is a really great article. It has helped me a lot. Thanks for sharing. What a great article and advice, however, if i ask these 6 questions and get the 6 replies, how do i post this onto my testimonial page, do i leave each paragraph as it is(how they have written it)? do i string it together myself, and if i do, do i have to reshow it to the client before posting… or do i just get the client to string it all together to make the one paragraph that gets posted on the testimonial page? If you feel weird about it, then get someone else to do it for you. In fact, in many situations, a third party does a better job. Great post. A piece of invaluable information. Excellent post Sean. I’m a copywriter, so like many on here, I would have to adapt the questions to fit, but this has certainly got me thinking. I always forget to ask my clients for testimonials these days(! ), but when I do, I will be referring back to this, definitely. Thanks and all the best! Well, you can have it in a system. When a client finishes a job, you put this question as a final request (as part of the paperwork) or you can just as easily put their name in an online form and it automatically sends out an email once the job is finished. Granted, it takes a bit of organisation. But remember that by not getting a testimonial from clients, you are depriving them from patting you on the back. You are depriving them of reliving their great adventure with you. It’s like a big trip. They want to tell their story. You have to get them to do so because they feel better and the upside is that they stand by you. When a person recommends you, they’re more likely to recommend you in the future. I didn’t go through all the comments so the answer may be there, but what is the best way you collect testimonials? Online form? Email? Phone call? Interview? Video? What has worked best and been the least time consuming for the client? Thanks for the good questions. I’ll add these to my processes and look forward to feedback. The quickest way is through e-mail, using an autoresponder. The more tedious way is the phone (with the call being recorded). Guess which testimonial is better? Yup, the phone is far superior to the e-mail. So it’s a choice between speed and amazing depth. Definitely going to incorporate these into our case study questionnaire. Good move. It’s one thing to read, another to apply it right away. Great tips and right on time! Will definitely use the 6 questions. I hope you do so quickly. The quicker you are the quicker the results you’ll see. I never thought of testimonials as stories. But in retrospect, that’s just what they are. And you’ve given us an even more powerful way to use those “stories” to address common objections prospects may have about buying our products. Nice post you have share people like it and this blog is very helpful for us. Indeed a very helpful series. Testimonials are great and every business ask them from their client. Most of the time without a proper guidelines we didn’t get good reviews from our clients. This is a perfect article about asking testimonials from clients. I’m not a big fan of long articles 🙂 , however, i love this. Thanks for sharing with us. 1. We sell new cars (commodity), so I plan to substitute “buy from our company” for “product”. Do you think that will accomplish the goals you have described? 2. I would like to gather some of these testimonials on video to be used on our website, I see these being recorded as they are taking delivery of their new vehicle. How would you envision going through the 6 questions on camera? Would we give the customer the questions ahead of time and then record their answers (without our employee in the shot) or record an “interview” with our employee asking each question? Any thoughts here would be appreciated! Yes, I’m am absolutely sure that it will work (that little change you made). You could easily do the video with the client in the showroom (some may agree to come back another day, some may give you the testimonial right away as they’re buying the car). I wanted to drive off after buying the car 🙂 Anyway, if there’s some sort of incentive to come back, they will. But even so, if I was happy, I’d probably have stayed and given a testimonial. In my case, the car sales guy was very nice, but a bit of a “bumble” and so it would have been hard to give a testimonial, but the manager was sharp as a tack. You can have a simple iPhone set up. I usually do that at workshops. Unfortunately these videos were shot a while ago and there’s a hum (but it still works). It’s also a bit out of focus, but when you watch you can get a lot of stuff in a few minutes. In fact, I’d recommend you show the client what another client did, and they would be more than happy if all it took was 5 minutes or so. These usually took fewer than 5 minutes to shoot.